Your broker authority is not real expensive nor is it real complicated IF you know what you are doing. So, don't be mislead. Some third party companies will advertise "broker authority" and not include the requirement or cost for the surety bond or trust fund. To the point, if you train with us, we do the applications for the MC#, the BOC-3, the UCR and the trust fund and it takes less than 45 minutes IF you know what you are doing. You will have your MC# instantaneously over the Internet. Other companies will charge you at least $200 more for the same service. Go figure ..... you want to pay an extra $200 or more, or you want to save $200 or more? Operating Authority - are you confused? As a freight broker instructor, I get a lot of phone calls and emails. There is a lot of confusion when it comes to freight broker requirements as opposed to starting a trucking company. The two have a couple similar requirements - but the two are completely different in other aspects. First, I don't get into trucking operations with my broker training. Truckers have their own requirements and this is NOT included in my training. Yet, many truckers call asking about freight brokering and say, "I already have my authority". I have to then ask them if they are talking about their trucking authority or do they have their broker authority. 99.9% of the time they are referring to their trucking authority. So, I tell them they need a separate authority if they want to become freight brokers. That's it ..... BUT, this is only the beginning. Go here below to find out more about the DETAILS. There have been some recent changes and YOU need to be on top of what's going on. Remember this, in our training, we will do the applications for your broker authority together. You won't have a lingering doubt as to whether these were done correctly or not. You can do them on your own. But, I recommend you wait until we train together. The application for your MC# can be intimidating and many clients have told me they were glad I was with them for this application. As far as the surety bond or trust fund is concerned, I will give you my input on what might be the best one for you. (Don't fall for the cheapest vendor). So, don't go it alone. I'm here. So You Think You Want to be a Freight Broker? You know, the business concept of freight brokering is quite simple: you find shippers with cargo to move and you find a truck to move that cargo. You then collect a commission for your matchmaking skills. Pretty simple, right? Well, some people buckle under the first step - the application for their MC number. This form looks very intimidating because trucking companies use the same form and much more information is required from them. But for the broker, it should take only about 8 minutes to complete IF you know what you are doing. If you don't know what you are doing, it can be confusing and frustrating. For example, if you were to apply for an EIN number for an LLC, the application will tell you that the LLC is not a corporation. And you can even elect to treat it as a sole proprietor IF you are a single member in the LLC. Yet, on the application for the MC number, it asks you to select which business entity you are: corporation, sole proprietorship or partnership. The instructions give an example for a corporation as John Doe Inc. or John Doe LLC. What's going on here? First, you read from one source that an LLC is not a corporation; now you are required to select corporation for an LLC on the Motor Carrier application. What is Your Freight Broker Authority & How Much Does It Cost? You will find some training programs offering the freight broker athority for $450. This is misleading. It may not include the UCR permit that is required. And, for sure, it does not include the cost of the trust fund. Through my training, a freight broker will get their MC#, the BOC-3 and the UCR for about $400. The trust fund depends upon which program a freight broker qualifies for. If the broker puts up their own $10K, the cost will run $550 per year. If the broker has good credit, the cost would run $950 per year. What if you don't have $10K laying around and what if you don't have good credit? There are other programs available that will require a deposit, perhaps, plus monthly installments where you can build your own trust fund over time. So, do not overlook the installment method if this is your only option. Through me, your total cost for your broker authority including the trust fund would run about $1,350 if you have good credit. Be careful here! Some vendors are charging well over $100 for the BOC-3 and you get it through me for $24.50. Questions? Call me at 1-888-526-ATEX (2839). Live and work in Canada? 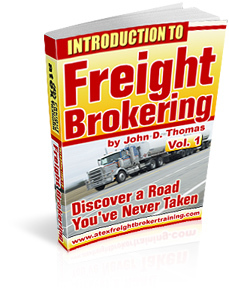 Want to become a freight broker? It is relatively easy. You can move cargo into and out of Canada but not from Point A to Point B in the USA. You do NOT need a USA based company. Start brokering in about 30 days or less. Call now to get started: 1-888-526-ATEX (2839). John will answer. Normally, getting a freight broker authority is quite simple and fast. The one area where there might be any hangup is in showing evidence of the $10,000 trust fund or surety bond. Now, some individuals put up their own $10K in which case, there is no credit check. But if you are looking for a financial organization to put up the $10K for you, you need to have "very good" credit. Otherwise, you may be making a deposit and paying in so much per month to build your own trust fund. Here is the thing: if you are being subjected to a credit check, the financial organization will look to an individual and not to the business entity. The individual should be working in the freight broker company and could be either the sole proprietor or an officer of a corporation. There are some other angles and if you have questions, give me a call at 1-888-526-ATEX (2839). It all sort of dove tails together. The training usually takes at least three weeks but more likely four. And sometimes much longer if that is what the client wants. At the end of four weeks or so, the freight broker will receive his or her "grant letter" from the Federal Motor Carrier Safety Administration (FMCSA). This letter is the formal letter granting authority to operate as a freight broker. This means that the motor carrier number has been received, the trust fund is in place and the BOC-3 has been obtained as well. With this grant letter, the freight broker will make two photocopies - one for the shipper set up package, and one for the carrier set up package. And that is it. You are good to go. There is no other business that is easier to get started in and, yet, no other business that can be so deceiving. You have to know what you are doing despite its seemingly simple concept. What Does It Take to Get Your Broker Authority? There is a lot of confusion surrounding what it takes to get one's broker authority. In most cases, it is a snap IF you know where to go, etc. And the process to get started only takes about 20-30- minutes over the phone with us. 1. Motor carrier number - No you cannot use your trucking company's MC#. You need a separate MC# for your freight broker business, The application only takes about 10 minutes if you know what you are doing. 2. Your surety bond or trust fund - if you have good credit, you may choose to have a financial institution put up the $10K for you. If you have your own $10K to put into a trust fund, this is okay too. For those with poor credit or no credit, there are other programs available but it will involve paying a deposit and about $500 per month to build your own trust fund. 3. The BOC-3 - this gives you legal representation in all 48 states. It is a no-brainer but some third party vendors are charging unjustified fees for this. Watch out. 4. The UCR - this is relatively new and, if you go directly to the government website, you will end up paying less than going through a third party. That is it. There are no background or criminal checks. There are not tests. We get you started on each of these over the telephone and Internet. The whole process can be quite simple as we work with you on these requirements. The entire cost on this can be less than $1,500 if you have good credit. This assumes you do not go through a third party that will charge you additional fees. The application process as described here is included in our training fee.